The DS certainly isn't short of puzzle games. Does Namco Bandai's latest release have enough charm to stand out from the crowd and represent a worthwhile purchase? Handheld consoles and puzzle games go hand in hand. Through the history of portable entertainment every major machine has played host to at least one truly ‘essential’ puzzler. The Gameboy was practically sold on the back of the addictive qualities of Tetris, the GameGear had the colourful Columns and Bandai’s moderately successfully Wonderswan was gifted with the excellent Gunpey. However, the Nintendo DS must surely qualify as the puzzle fan’s machine of choice. There has been a truly dazzling array of genre classics released for the dual screen handheld – Meteos, Tetris DS, Touch Panic and Puzzle Loop to name just a few. Now Nacmo Bandai have created yet another modern classic to add to that list – Trioncube. In order to succeed every puzzle game needs a unique ‘hook’. It’s difficult to describe exactly what the hook of Trioncube is, but for the sake of comparison it’s probably best to call it a ‘reverse Tetris’. Instead of ridding the screen of blocks the player is actively encouraged to fill it up as much as possible. The object is to create three-by-three squares using the falling blocks. Once created, these squares do not disappear as you might expect but remain on screen and the player is given the chance to add yet more in order to keep their combo going. 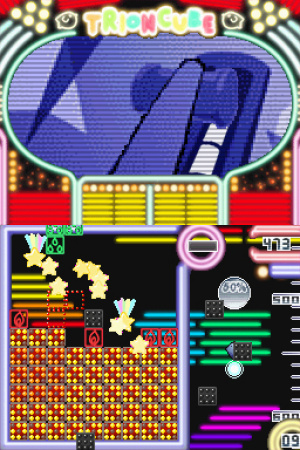 As the screen fills the opportunity to create more three-by-three squares gradually diminishes, and if the player drops a block that doesn’t link properly (or the screen is filled completely), the completed squares are transformed into coins that are added to the players score, thus effectively ending the combo. Progress within each stage is represented by the movement of your character’s bird-shaped spaceship – called ‘Penko’. The better you do, the faster and further the ship travels. 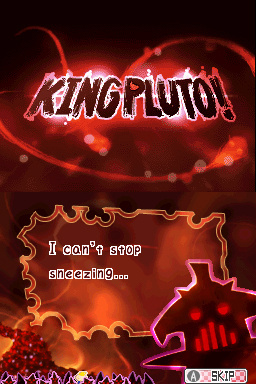 Some stages apply pressure by forcing the player to race against another opponent and others introduce a boss character that must be overcome in order to progress, but on the whole the basic gameplay remains the same throughout. Several play modes are available in Trioncube. ‘Arcade’ is a perfect for short bursts, offering just a handful of levels. ‘Story’ mode is more substantial with several different missions to complete (although it has to be said that the actual story is very lightweight). 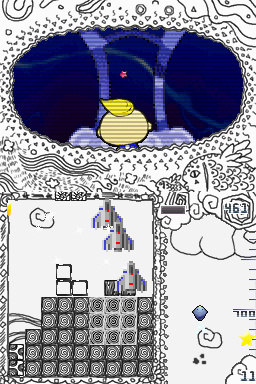 ‘Endless’ mode provides just under a hundred different stages (so technically it’s not ‘endless’) and will provide the sternest challenge to players. In all of these modes the player earns money for the distance travelled and coins earned during play. These coins can then be used to unlock new screen skins and sound effects. Although this may not sound like much of a reward for the hours and hours of playtime you will have to invest in order to unlock everything, it’s strangely addictive and serves as adequate incentive to master everything the game has to offer. Graphically and sonically, Trioncube is extremely basic but features a clean 2D design that is unlikely to offend anyone. The actual gameplay doesn’t make use of the touch screen at all (it’s only used in menus) and although the second screen displays various animations during play, you’re unlikely to shift your view from the bottom screen, where the action takes place. Therefore it could be argued that this is a GBA release that has been cynically upgraded for the DS. 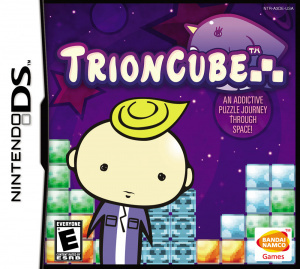 Trioncube certainly doesn’t showcase the unique features of the DS in the same way Meteos did, but it’s hard to see how the developers could have integrated them without affecting the gameplay in a negative manner. Namco Bandai have obviously set their sights low with Trioncube – it’s a budget title and costs roughly half of what a full price DS release would set you back – but thanks to the challenge of unlocking everything contained within it should provide as much, if not more, entertainment than your average release. When the game has eventually surrendered all its secrets (and that will take some time) the gameplay remains compulsive enough to keep you coming back for more and the multiplayer modes will also considerably extend the longevity. With the extremely modest retail price in mind, it’s hard not to recommend Trioncube to any self-respecting DS puzzle fan.